They're dark. I mean really, really, turn-all-the-lights-on-in-the-middle-of-the-day kind of dark. All that beautiful quarter sawn, oak paneling doesn't have the bright interiors that I crave. Add a couple of mica shade lamps and you still don't get a lot more light. Throw in some earthy, Craftsman paint colors on the wall and it just adds to the darkness. Sooooooo, while I want to try and be somewhat authentic in our approach, we're going to go with a lighter, brighter look for our bungalow. And that starts with our design selections for the first floor. 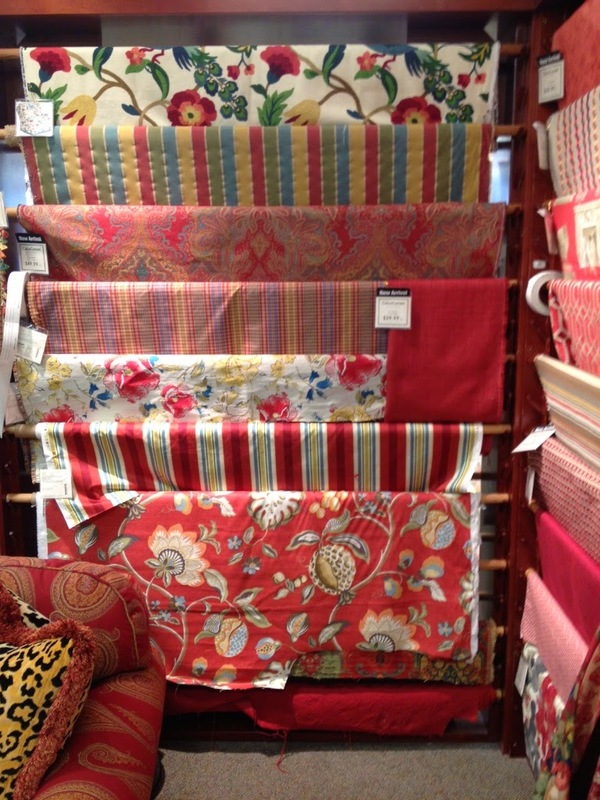 I loved the idea of using a William Morris fabric for our window treatments. They're authentic, with beautiful designs. But when I started looking through fabric swatches, they just seemed a little too deep and dark, for what we need. So, I started looking a little more and stumbled across this fabric display at Calico Corner. See the one at the bottom? It's still got a traditional feel, but gives us a punch of color with the red background and plays on all the greens and golds that we want as well. Best of all, it has so many colors, it gave us a lot of options for wall color. But it turned out to be almost too many options. 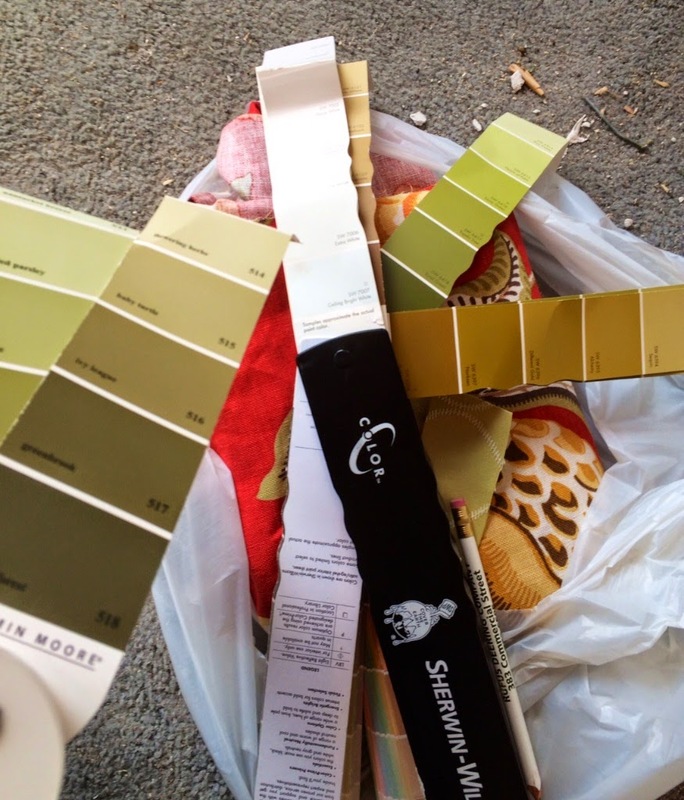 After multiple trips to Sherwin Williams to buy paint samples, I tried greens and golds and creams. I put a checkerboard of color samples on the wall. And after lots of agonizing, finally decided to use SW White Duck for the wall color (it's the one towards the middle, next to the white trim color). It's a creamy beige and looks great with the fabric, the white trim and the creamy kitchen subway tiles. It's also a great neutral for the future homeowner. But we still need a punch of color somewhere (my painter lets me have a total of 3 paint colors in the house). So, I am thinking about a 'feature wall' in the breakfast room, which is the brightest room in the house with 4 windows and a glass door. I found this fabulous reproduction poster from the 30's of Acadia National Park (It's a design based on the Works Project Administration (WPA) Federal Art Project from the 1930's. How cool is that!) I'm trying to decide if it looks best with the green or the gold. I'd love to hear your thoughts! But before you start to worry that I'll be making everything too light, rest assured. We are going to install custom oak trim in many areas of the house - colonades, stairwell and hutch top - so there will be beautiful natural wood finishes. We'll balance it with white painted trim, so the house will continue to be open and light. And for the Craftsman purists out there, it's not unusual for these houses to have had the trim painted over the years. So we're still following tradition, while keeping a bright interior. It's so nice to be focusing on the interior now! Yup! Craftsmans were quite dark. But as you mentioned, as the families lived there awhile and times/styles changed, they too started changing to lighter colors. The fact that you've changed the floor plan from the original also speaks to the fact that as the 'imaginary family' you've moved on to more updated ways of living. Since you asked for our thoughts..... 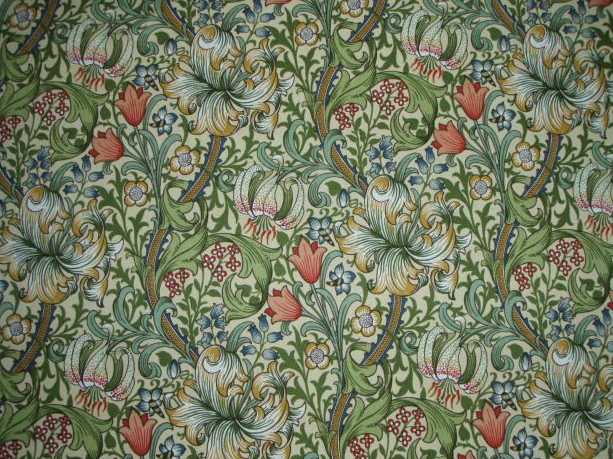 The fabric is pretty and is somewhat reminiscent of the William Morris print. However the scale is far too large for what would have been used originally in a Craftsman. 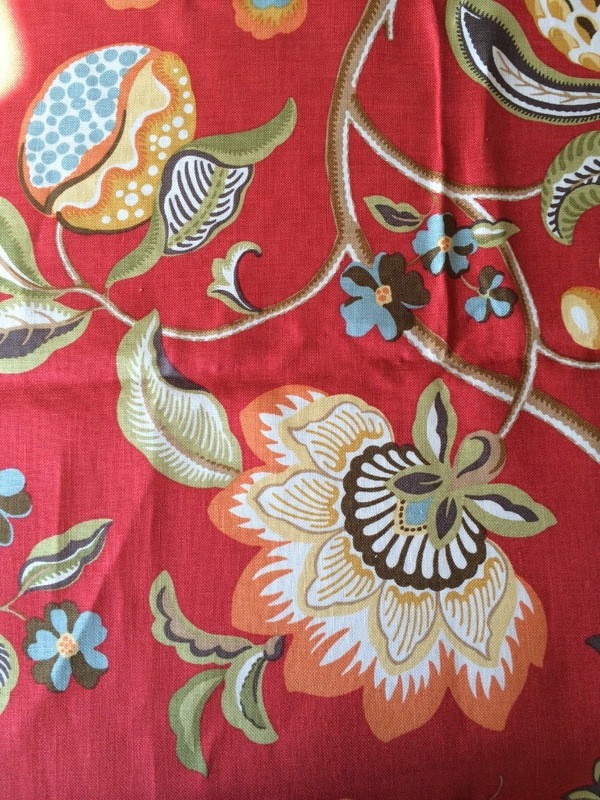 Might you find something similar in a smaller print and still stay in the red family? As to the paint to go with the vintage poster...I'd say a light gold (providing you're using the fabric you mentioned--or one that will have similar colors in it). I think the gold paint will play nicely with the golds in the fabric especially if the rooms are close to each other. Thanks Connie, I too would have like a smaller scale fabric, but after lots of searching I couldn't find anything and I LOVE this one. So we'll be using it :-) But I like your suggestion about golds, I think they'll work well! I would love to see you go with the green in the breakfast room. I love following your house renovation blog! I think I have been commenting on every one of your posts, LOL! NO! Ahem, I am not stalking you as you re-do this house, nope. Not. Thanks as always for the input. Appreciate it, especially since you live in a Craftsman bungalow! I looove it all. And I really love the WPA artist period. Some really compelling work was done during that period! P.S. All the trim and doors and built-ins are white in our home. We like it, though, and I've painted over the cream that was here when we move in -- it's now SW Alabaster... we thought about removing all the paint, but gheesh, just don't have the time, energy, or funds to get it done, LOL! My grandmother lived in a lovely Craftsman, but some of the woodwork had been painted. The kitchen walls were cream, and the woodwork was painted a fairly light green. The diningroom, including the built-in china cabinet, and (faux) fireplace mantel were all dark natural wood. In the living room the woodwork was painted white. Sounds odd, now that I write it. Anyway, I far preferred the white. I feel that the Craftsman style can be interpreted for today...and I think today many people prefer light, bright interiors. Thanks Julie. I'll be that light green was really pretty! I have been collecting some of those WPA-style postcards from the National Parks that we have visited over the last few years. I can't wait to get the few that we have framed and hung - but not until I get the Yellowstone one this summer! As for your print: If I cover one color while looking at the print w/ the uncovered color, the green really seems to make the gold in the print pop!